Shaping your technology into commercial success. How do I find the commercial opportunity for my science? Where does my technology fit into today’s reimbursement system? What is the customer-investor-acquirer relationship? Navigating the path to commercialization isn’t easy. Sure, it takes money. But sometimes you’re missing the right management team, the right resources to navigate a complex regulatory problem, or solid market research to support your commercialization plan. Our Executives-in-Residence have had successful careers in life sciences, and can guide you to success as well. And our team of Investment Managers can provide information and resources to steer you in the right direction. 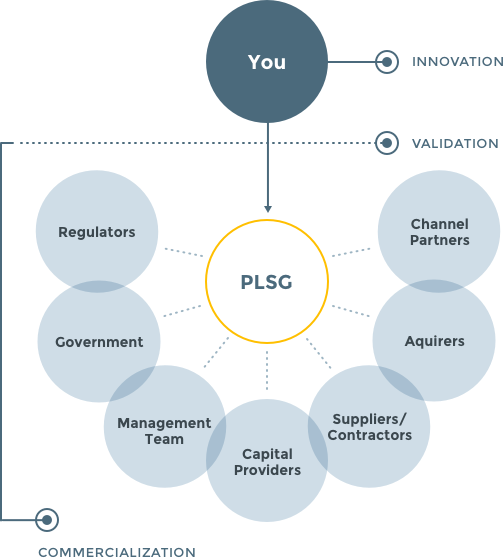 The PLSG has worked with nearly 500 companies and scores of entrepreneurs in all aspects of life sciences. While they all share a desire to turn their technology into profitable commercialized products, each entrepreneur has his or her own thoughts on what contributes to the ultimate success of a venture. Here, in their own words, are a few of those thoughts and keys to success. You can’t be an expert in everything. You’re an expert on your technology, but in business it’s often the undocumented, experiential expertise that can make the difference. Let us help you navigate the healthcare system and position your technology for competitive and funding success. Connections are everything, especially in life sciences. Sometimes it’s who you know that can propel you forward. PLSG’s Executives-in-Residence can provide a wealth of personal industry connections and networks. And PLSG’s outreach and networking events bring entrepreneurs, investors and domain experts together. Technology is only a piece of the pie. You need to understand how to think like an investor if you want your vision to become reality. We’ll help you understand the financial hurdles, determine fundable milestones, and prepare you for funding success. And we have capital of our own to help move you forward. We are more than happy to provide you with the Life Sciences expertise, tools and materials to help you make wise decisions. Our results speak for themselves. Please contact us to learn more about our current investment opportunities.